- Jaw Plates are ground and Hardened to 54-56 HRC. - Accuracy in Squareness 0.02/100mm. 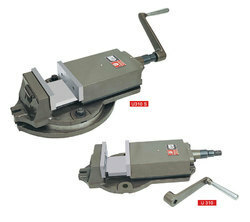 - Vise body of high tensile, closed grain Cast Iron. - Hardened and ground Jaw Plates. - Swivel base graduated 360° for horizontal indexing. - Totally enclosed acme screw. 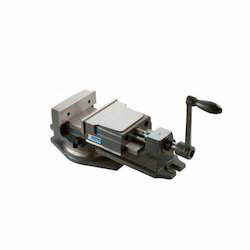 We offer high grade quality milling vices from 4" - 12" in size fixed base, swivel base and tilting type vices. The jaws are hardened and ground for greater accuracy. The casting of the vice is ll graded accuracy. - Fine acme thread screw and jaws are made of special steeel properly hardened, fixed jaws is proviced with vertical & horizontal 'V' groove to hold the round job firmly. - The swivel base is graduated fully through 360 degree. - Vice cab be converted from swivel base to fix by removing the base. Owing to our rich industry experience and our expertise, we are dealing in offering Milling Machine Vise to our customers. Our range can be availed in the range listed as compact, high precision, high rigidity and limited linear guide. This product is incorporates all very important components and is engineered with perfection.